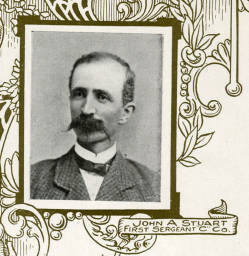 Biography & Genealogy: John Andrew Stuart, Class of 1865: New Market Cadet; First (orderly) sergeant, Co. C. Genealogy: Born- October 4, 1843, in Augusta County, Va. Father- Archibald Patterson Stuart; Mother- Josephine Theresa Xaupi. Pat. Grandfather- Archibald Stuart; Pat. Grandmother- Eleanor Briscoe. Mat. Granfather- John Andrew Xaupi; Mat. Grandmother- Josephine Zano. Married- S. Pauline Carpenter; no children. Careers: Farmer. Died- February 13, 1908, at Lowry, Va.